Have programs that need to run automatically on your machine and need to autologin and lock your server or computer at startup? Here’s a simple way with the use of a couple free programs. 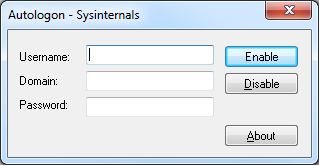 While Autologin by Sysinternals provides an encrypted way to autologin with your credentials, you may still want to autolock your server or computer after bootup. Auto Logon & Lock provides a way to both autologin (PCs) and autolock (PCs and servers) your system after bootup and autologin. 1) Run “Lock.exe” from the archive to test if the application runs without errors. If all is well your desktop should lock. Logon again and Windows Explorer should be open. You might want to create a System Restore Point before proceeding just to be safe. 3) Run “lockcmd.reg” from the archive and click Yes in the dialog box. You must run this while logged on to the account which you want to enable auto logon for. lockcmd.reg contains the following script which runs the .exe to autolock your computer at startup. Next, create a string in your registry for lock.vbs to autorun during startup. Press the ENTER key.This command will load the Advanced User Accounts Control Panel applet. Your system should now be able to boot up automatically and lock itself! This is very useful to me. Great script! Used this on my server. Thanks! I really need this script on how to auto lock my computer after bootup.